Dependency Injection sounds scary… but it’s actually pretty simple. 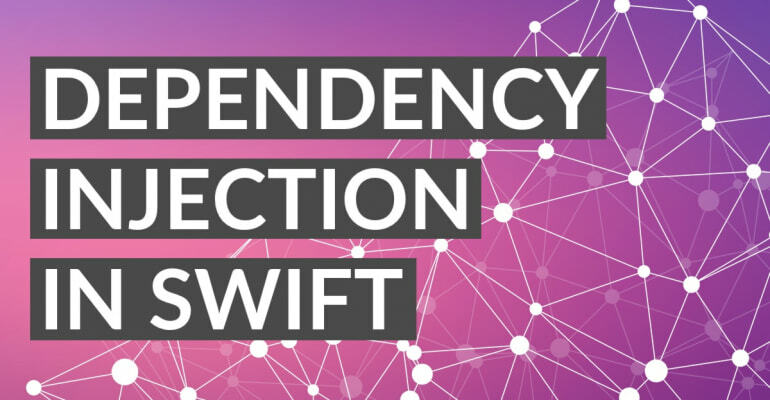 On top of that, understanding dependency injection will greatly improve your code quality and productivity as a Swift developer! Dependency injection is a technique whereby one object supplies the dependencies of another object. A dependency is an object that can be used, like a service. An injection is the passing of a dependency to a dependent object (a client) that would use it. Passing the service to the client, rather than allowing a client to build or find the service, is the fundamental requirement of the pattern. All these principles have one thing in common: they make your code more maintainable by making it modular. Instead of creating one big pile of code, you create separate your code into modules that interact with each other. You’ve probably heard of “spaghetti code” before. It’s a chaotic codebase, that’s hard to maintain, and even harder to improve. You want to avoid spaghetti code at all costs, and dependency injection helps with that. Ready? Let’s find out how! Let’s first start by finding out what dependency injection really is. You’ll soon realize that the term “dependency injection” is, in fact, a perfect word for this development concept. You’re literally injecting a dependency with code. But… what’s a dependency? OK, let’s look at this code example. The protocol Propulsion defines one function: move(). When a class wants to conform to the protocol, it will need to implement that move() function. The class has one property engine, of protocol type Propulsion. You can assign any type of object to engine as long as it conforms to the Propulsion protocol. When an instance of Vehicle is initialized, an instance of RaceCarEngine is assigned to the property engine. Then, when the function forward() is called, the vehicle will call the move() function on the engine object. That’s what you see in the above code example. The protocol Propulsion defines the rules for the engine, and within the Vehicle functions the engine is initialized and used to call the move() function. As you can see it implements the Propulsion protocol, and defines an implementation for the required move() function. You define a car variable of type Vehicle, and call the forward() function to move the car with the engine. So what’s the dependency here? The dependency is inside the init() function of Vehicle, because it references the RaceCarEngine class. Class Vehicle is tightly coupled with the RaceCarEngine class. You don’t want that! Because you’ve directly referenced RaceCarEngine from Vehicle, the Vehicle class now depends on the RaceCarEngine to function. Is there away to get around that? Unfortunately, there’s no way to get around dependencies. Dependencies aren’t bad! Your app’s code is interconnected, because all its components need to work together. What is bad about dependencies is that it’s easy to create tightly coupled modules, with dependencies all over the place. 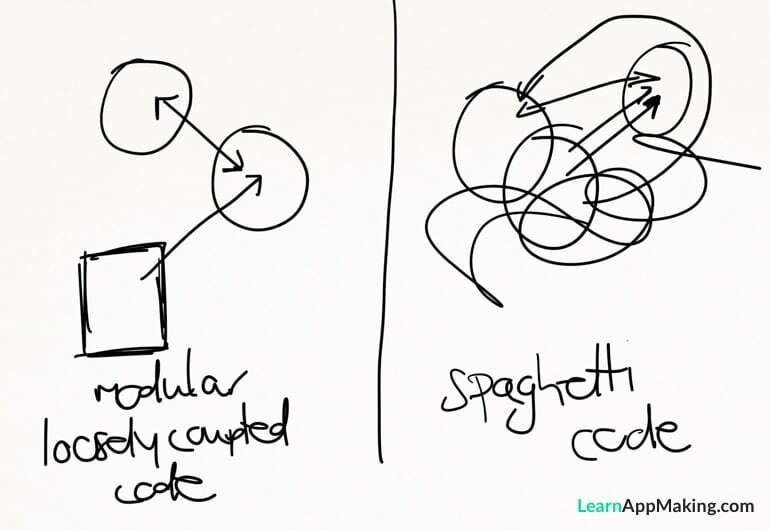 A typical sign of spaghetti code is non-modularity and no structure for dependencies. The difference is subtle. Instead of directly using the RaceCarEngine class, the Vehicle class now takes a Propulsion instance as an initializer parameter. You can see that in the init() function. A parameter engine can be passed to the initializer function. Within the initializer, it’s assigned to the engine property. Instead of directly using the RaceCarEngine inside the Vehicle class, it’s now used outside the Vehicle class and injected as a parameter via the initializer. // Output: 3-2-1... LIFT OFF... PPPPSSSSCHHHHOOOOOOOOOMMMMMM!!! Don’t get this the wrong way: you could have switched out the engine without using dependency injection! You simply would have changed the Vehicle class to change the engine type, right? First of all, dependency injection is simply part of good code architecture and design. It increases the modularity of your code, it helps with separating concerns, and it makes your code easier to maintain. You’re working with code you don’t have access to, all the time! Think about the UIKit frameworks, or a Firebase library, or Alamofire. Even though you have, strictly speaking, “access” to the code – you can’t change it! The Cocoa Touch SDK has a neat solution for that: delegation. Delegation is a programming design pattern that enables a class to hand-off some of its responsibilities to another class instance. In many Cocoa Touch classes you can assign your own object to special delegate properties. The framework classes then call functions on your delegate objects. Since you have control over the delegate objects, you can change the behavior of framework classes without changing their code directly. Moreover, when the time comes to replace the REST API with a new back-end, you only have to code the back-end implementation. If the new back-end exposes the same getItems() function, it should work perfectly fine. Yay, modularity! With dependency injection you can easily switch out dependencies. In the previous example, the one with the car engine, you saw that you could change the engine implementation of the car. The diagnostics rocket engine sends logging data to an external service. When it starts up, it’ll send a I'm starting up message to the logging service. The rocket engine also does more calculations to generate diagnostics data, so it’s more resource intensive. With dependency injection you can easily switch out the actual rocket engine, and the diagnostics engine without changing any core rocket code. Also, when the rocket engine isn’t ready yet, you can create a “mock” engine. In practical iOS app development this happens for instance when you’re working with an external API. The API isn’t ready yet, so you create a mock API that just returns representative “fake” data. Based on the data you can build your app. When the real API is ready, you simply add in the new dependency and you’re done. Unit testing is a practice in software development to test the output of code, based on a given input, and comparing that output to a predefined value. Compare it to a simple pocket calculator. You test whether the addition function works correctly by calculating 1 + 1. When the result is 2, you know it works, and when the result is something else, you know the function is broken. Unit testing is typically labor intensive, so you want to automate as much as possible. It’s easier to test modular code that isn’t tightly coupled. With dependency injection you can quickly inject a testing class as a dependency without having to replace entire blocks of code. You can test the dependency itself, i.e. if the rocket engine runs smoothly, or the code that uses the dependency, i.e. if the rocket moves based on input from the rocket engine. The variable rocketEngine is provided as an argument for the Vehicle constructor method, thus constructor injection (in Swift, it’s called an initializer). In Swift you can also use the property, of course. One of the beneficial side-effects of using constructor injection is that it becomes very clear when a particular class violates the Single responsibility principle. The single responsibility principle states that, logically, every class should have one responsibility. Think “communicate with the REST webservice” or “retrieve/write data from the database”. When a constructor takes a large number of dependencies as parameters, you should suspect it violates the single responsibility principle. After all, why would it need so many dependencies if it only has one thing to be responsible for? Understanding dependency injection is a great step towards creating more modular, more maintainable and less error-prone code. In this article, you’ve learned what dependency injection is, how to use it and when to use it. Awesome!